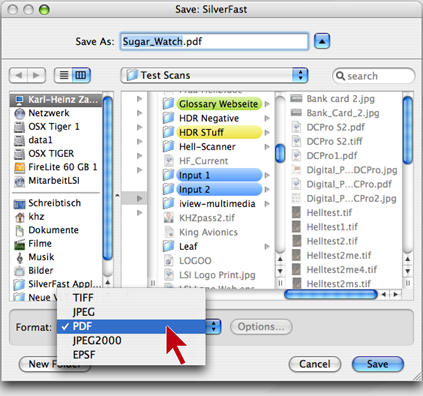 SilverFast 6.5 allows the user to easily convert documents into PDF files. This makes it easy to save and send documents or images. If a document is saved as a PDF file it uses less space compared to a "normal" file format. PDF files keep the appearance of the originals and preserve all of the information. Textures, drawings, 3D and colored graphics, and especially pictures can be converted into PDF files regardless of the original format and without any changes in appearance. PDF is a widespread standard for a secure and dependable interchange of electronic data. It is acknowledged worldwide and also compatible with PDF/A, PDF/X and PDF/E. It is not possible to save 1-bit line art scans and 8-bit grayscale scans in PDF format.